Why are some viruses "naked"? A virus is an infectious pathogen that targets cells. A pathogen is something that causes disease. Infectious means it can be transmitted from one organism to another. Viruses can infect all cellular lifeforms from single celled bacteria to multicellular plants and animals. The cell is considered the basic unit of life. Cells are composed of a membrane enclosing the cell contents. Cell contents consist of genetic material, organelles, and cytoplasm. A virus is composed of genetic material – either DNA2 or RNA3, but not both – that is encapsulated in a protein covering called a capsid. Some viruses have an additional lipid4 covering. 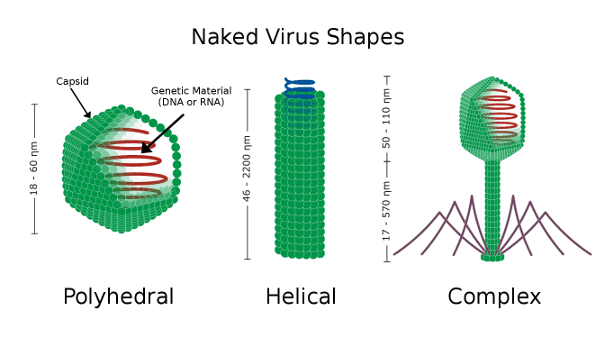 Viruses with only a capsid covering are called naked viruses. Viruses with the additional lipid covering are called enveloped viruses. The outer covering is discarded when a virus infects a cell. The capsid or lipid shell has “spikes” on it that allow the virus to bind to receptors on the cell. You can think of this as a lock and key – the key (spike) only fits (binds) certain locks (receptors). Viruses can only infect cells to which they can bind. 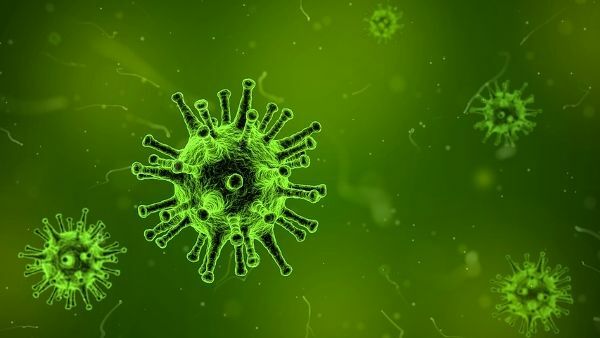 This means that not all viruses can infect all organisms or cells. Viruses tend to be species and cell specific. Some scientists make a distinction between virus and virion. They use virion to refer to the capsid encapsulated genetic material that has not yet infected a cell. In other words, a virion is a complete virus particle ready to infect. And they use the term virus to mean the genetic material inside an infected cell. A virus is an infectious pathogen that targets cells. Viruses can infect all cellular lifeforms from single celled bacteria to multicellular plants and animals. Some scientists make a distinction between virus and virion.